Sekhmet, in ancient Egypt, was portrayed as a female figure with the head of a lioness. In the mythology, it was Sekhmet who meted out Divine vengeance when errant humanity neglected to worship the gods and took matters into its own unknowing hands. Her destructive rampages were designed to restore rightful order, she was the goddess who heals… but by fire. Here in these pages she is spoken for (in appropriately contemporary terminology) by her amanuensis, John Anthony West, rogue Egyptologist, author of Serpent in the Sky: the High Wisdom of Ancient Egypt and other books and student of the ‘symbolist’ school of Egyptology developed by the Alsatian mathematician and philosopher, R.A. Schwaller de Lubicz, and developer of the controversial but geologically supported theory that the Great Sphinx of Giza was built, not by the dynastic Egyptians, but by an earlier civilization flourishing in Egypt around 12,000 or more years ago. Civilization is like a park. It’s not ‘natural’, it doesn’t just happen in the normal course of affairs. Nature, left to her own devices will not produce a park; human beings, interested only in procreation, food, shelter and the acquisition of material goods will not produce a civilization. Both park and civilization are contingent upon human will, intelligence, industry and intervention — and the understanding that both natural world and human beings possesses a hidden or occult potential. Both park and civilization may be seen as exaltations of the natural order. Only human beings can bring them forth into manifestation. Once established, the park/civilization calls for endless cooperation and intelligent attention if it is to flourish. When the parkkeepers, (its priests, scientists, philosophers and artists) are drunk, crazy, greedy and lazy the park quickly degenerates. Once the process of degeneration sets in, there is no direction from above. Without direction from above, the humble but necessary carters and traders who bring in the manure, tools and supplies quickly take advantage of the anarchy. Dissatisfied with their lowly status, they euphemize themselves into “businessmen”, “industrialists”, “entrepreneurs”, “marketing managers”, “advertising executives” and “financiers” and preempt positions of power. Their power is then maintained by a hierarchy of mercenaries, henchmen and yes-men similarly euphemized into “politicians”. Chaos ensues. And in this particular instance that chaos is called “Progress”. A pseudo-science is then invented to justify the production and distribution of ever-greater heaps of manure. This pseudo-science is called “economics”. It has no basis in reality, yet it seems to –once the manure carters have taken over the park. In the absence of a functioning, spiritually based religion, “economics” is then glorified in turn into a pseudo-religion: Theo-economics, which, supported by its accompanying philosophy of Metafinance, becomes the catechism of the Church of Progress. And so we find ourselves today. The oaks and maples are blighted and rot from the core out; the shrubbery grows rampant and out of control, the ponds are stagnant, weeds, brambles and poison ivy take over all open spaces, and everything is covered with manure. There is no room for bear or deer or wolves to live, but bugs and vermin flourish. What had been an exaltation of nature becomes nature degraded — to many a state far less satisfactory than nature left to her own devices which in turn provokes a nostalgia for simpler times. Left to itself, sooner or later the park will revert back to nature leaving little trace of its former state. But meanwhile, life in the park –except for the bugs, the vermin and the manure carters– is hell. How then to reverse the process? Obviously it can’t be stopped. It has to run its course. Nothing can nourish the oaks and maples back to health (in the park of Western Civilization these trees were stunted, diseased and grotesquely deformed to begin with and their conversion into useful firewood will provoke little mourning). Pruning the shrubbery is next to useless. There are only a couple of alternatives. The simplest of course is set the whole thing on fire, burn everything to the ground, and start from scratch. Ancient legends and texts around the world seem to indicate that this has happened in the past. Sodom and Gomorrah may refer to such an event; Plato’s ‘Atlantis’ to another version of the same; in the prophetic Hermetic book of Aesclepius (ca. 2nd Century AD) Hermes Trismegistus (Thrice Great Hermes) the Neoplatonic name for Djehuti, or Thoth, the ancient Egyptian embodiment of Divine Wisdom, declares unequivocally that this has been the repeated fate of parks when the parkkeepers go berserk. And of course the potential for a conflagration of this sort is ever-present today– nuclear, environmental, pestilential, or any combination thereof. If that is what is actually in store, the Armageddonites have the only solution. Head for the hills, prepare bunkers stocked with assault rifles and supplies of pork and beans and hope to ride out the holocaust. But if that is not the preordained and ineluctable denouement, perhaps the park can be revivified even as it goes through its necessary process of dissolution: salvaging what is still viable and salvageable, dismantling and recycling what is not, disposing of what is noxious, toxic and inessential, and reestablishing the correct chain of command as a prerequisite to a new order. All of this takes time, vision, a common aim, and a wide variety of complementary skills. Enlightened gardeners must replant trees. (It is a curious fact that, just before they die, trees often produce far more nuts and seeds than they do in healthy maturity.) In this case, the trees will not be genetic clones of the old (the park/civilization analogy is not exact –analogies never are. But they will be viable mutations based upon the same eternal principles — what Schwaller de Lubicz called the doctrine of the return to the “source”; what Graham Hancock calls “the science of immortality”. In ancient Egypt the gardeners were the followers of Osiris, divine creator of civilization, embodiment of the principle of regeneration and renewal, the mortal “god” who dies but who carries the seed of eternal life (Horus) within him. Landscape architects (sons and daughters of Ptah, architect of heaven and earth) must redesign the entire plan to conform to the radically changed conditions of a new precessional age. The parkkeepers have to be sobered up and brought back to sanity –or summarily fired and replaced. The arrogant manure carters must be deprived of power and put back in their rightful, honorable, but subordinate positions. But before constructive gardening and landscaping activity can take place on a grand scale, before the ponds can be purified and restocked with fish, the ground first has to be thoroughly cleared. The brambles have to be chopped down, the poison ivy pulled out by the roots, the deadwood cleared away and the weeds composted. 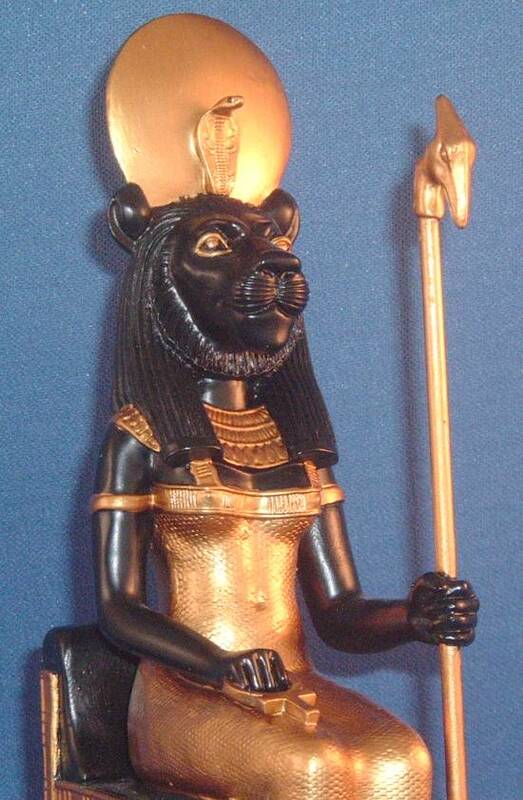 In Egypt, this was the work of Sekhmet, the lioness, female aspect of the fire principle, she who both destroys and heals … through fire and purgation. Appropriately equipped with flame-thrower and chainsaw to cope with the stubborn contemporary breed of weed, bramble and poison ivy, it is Sekhmet’s twenty-first century job to clear the way for the gardeners and architects; to apply the wrecking ball to the Church of Progress. Civilization is not a birthright, it is a privilege. We can act upon it, or ignore it — the latter at our peril. Hers is the path of constructive destruction. In these occasional essays I shall be reporting on Sekhmet’s work-in-progress. This entry was posted in egypt and tagged ancient civilisations, egypt, john anthony west. Bookmark the permalink.